There's been a lot of buzz about enrichment in pet circles! But just like socialization, there's a right way to do it that can get lost in a word's popularity. So what exactly is enrichment? According to the dictionary, it's defined as "the act of making fuller or more meaningful or rewarding." In this case, what we're making more rewarding is our dogs' quality of life! Dogs are meant to live active lives, rather than sleep until their owners come home. We often can't be home and interacting with our dogs as often as they'd like, so enrichment is a great way to help keep them stimulated and busy- not to mention keeping them from destroying the sofa. The six categories of enrichment are social, cognitive, physical, sensory, toy, and feeding. We'll look at each of these in depth and provide suggestions for all of them- not every dog will find all the different types appealing. Just do what works for your dog! Social enrichment involves letting your dog meet people and animals in new environments. There are lots of ways to go about this- social leash walks, going to the park, taking your dog shopping or to restaurant patios, and going swimming at the lake! If your dog prefers to hang back and watch rather than actively socialize, that's fine. Try going for more car rides and keep your distance from the overly-exciting things. And a word of caution about dog parks- you never know who's there, who's been vaccinated, or who doesn't actually get along well with other dogs. It's always safer to limit social enrichment to dogs you already know well. Remember, the point is to make life more exciting, so take a break or try something else if your dog isn't enjoying it! Just like people, all dogs don't like all activities- taking someone who's afraid of water to a waterpark doesn't actually make their day more fun. Cognitive enrichment is for the smartypants out there- it's all about providing your dog with opportunities for thinking and problem solving! Things like regular training, agility, rally, and puzzle toys are great ways to keep that noggin working. Playing hide and seek with your dog is also a fun way to engage your dog's brain. Use a crate or doors to keep your dog out of the way as you hide treats around the house or toys in the backyard, then encourage your dog to find them all! Just like people, dogs like to redecorate their environment sometimes. By providing them a productive outlet for this, you can avoid them "redecorating" with your cushions, or shoes, or stuffing from toys. Sand box dig pits, blanket forts, pop up tunnels, and other things along these lines are fun things you can encourage your dog to explore! Dogs' senses are different from ours- most people know that dogs have a superior sense of smell and are colorblind, but did you also know they can hear four times better than we can? Or that their sense of taste is about six times worse than ours? Play to their strengths! Scented bubbles, wind chimes, snuffle mats, and nosework are exciting ways to engage different parts of your dog's brain. Did you know that you're already providing enrichment for your dog? Dog toys themselves are inherently interesting and fun for our furry friends! You may have noticed that your dog loses interest in their toys and chews after a while. Lucky for us, dogs have short memories when it comes to their toys! Having a mix of toys (tugs, balls, flirt poles, rubber toys, chews, etc) and rotating them out on a biweekly or monthly basis tricks your dog into having a never-ending supply of new and interesting toys without breaking your budget! It may seem like enrichment has to be this huge production, but at it's core, enrichment is just about creating variety in our dogs' lives! If you're not ready to spend an afternoon building a doggy sandbox or set aside time each week to meal-prep frozen goodies, some simple ways to incorporate enrichment into your day-to-day routine are as easy as taking a different route on your walk, introducing new toys and rotating through the ones you already have, taking your dog with you to a drive-through, or attending a training class with us! Remember, if your dog doesn't want to do something, it won't be beneficial! Don't force it. There are a lot of suggestions in this article, so only use what works for you and your household. The best enrichment is the kind you'll actually implement! 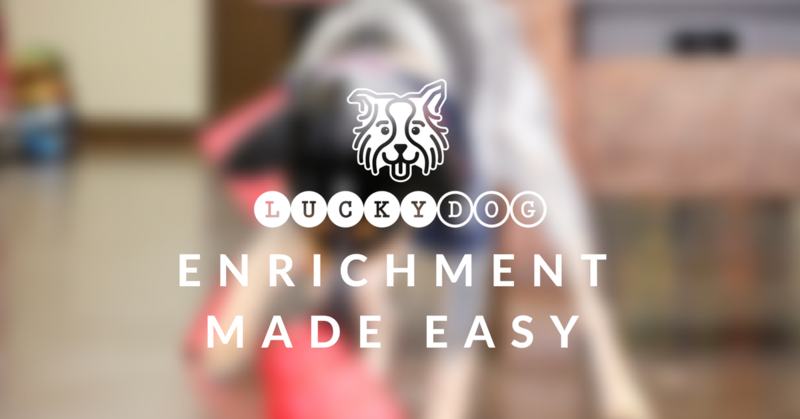 ⟵What’s New at Lucky Dog?